There are times when games you come across by accident turn out to be real jewels. 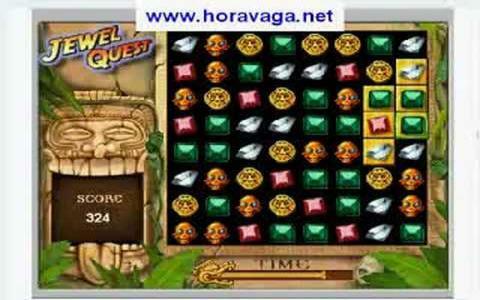 One such game is Jewel Quest. This 2d match-em-up game, has all the necessary ingredients to be successful. It's very simple, the objective is to match as many blocks (minimum of three same blocks) in the allotted time frame. It has a nice Indiana Jones ring to it, with gold coins, diamonds and reddish skulls. While this sounds simple enough, the game is highly addictive. Once you get the hang of it, you will start to see patterns emerging, and soon enough you will find yourself carefully planning your next move. Don't be fooled by the simple interface and the overall look of the game. After a while you will realize that this is a challenging game, that requires your full attention. It gets increasingly difficult to pair up the blocks as time goes by. Great gameplay, simplicity and nicely done sound make this game a great choice to pass up free time. I highly recommend it to anyone. You can also try the sequels, Jewel Quest 2 and Jewel Quest 3.